Aim : To delineate and characterize the cytomorphologic features of pilomatrixoma (PMX) helpful in correct diagnosis of the lesion on fine needle aspiration cytology (FNAC). Materials and Methods : Archival records of clinical findings, FNAC and histopathological reports of PMX cases were analyzed. Aspirate findings in 14 cases of PMX were correlated with detailed clinical data and subsequent histopathology on excisional biopsy. Different morphological findings were graded semiquantitatively from 0 to 3+. Results : The series showed female preponderance, with head and neck being the commonest site. Majority patients had a single tumor with mean size of 1.6 cm. Out of 14 biopsy proven cases of PMX, cytology findings revealed PMX in 7 cases on the basis of ghost cells, groups of basaloid cells, squamous cells in combination with multinucleated giant cells and calcium deposits in a background of debris. The main reasons for erroneous diagnosis were predominance of one component over the others and non-representative aspirated material. 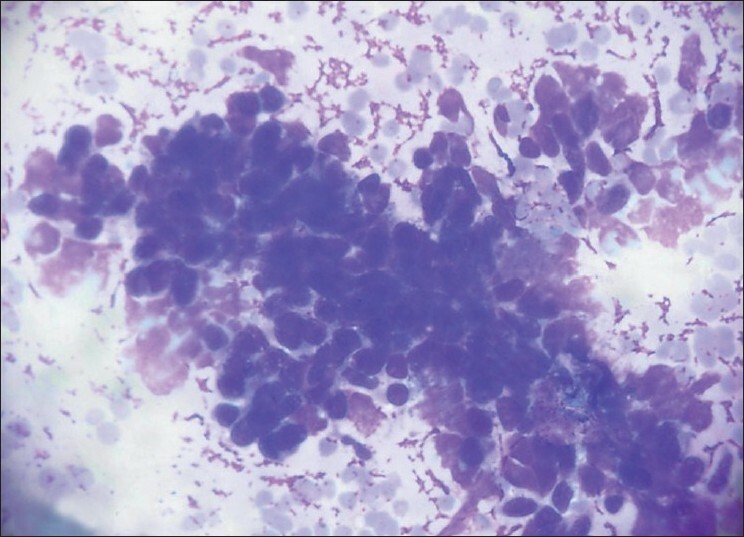 Conclusions : The cytological features of PMX are characteristic and allow a conclusive diagnosis provided the smears are examined keenly bearing in mind the diagnostic traps that can mislead a cytopathologist. Background : Micronuclei in exfoliated oral epithelial cells have been shown in some studies to correlate with severity of this genotoxic damage. This severity can be measured in terms of grading of the lesions. Aim : To correlate frequency of micronuclei (MN) in oral exfoliated cells in clinically diagnosed cases of oral squamous cell carcinoma (OSCC) followed by a histopathological grading. Materials and Methods : The study subjects consisted of clinically diagnosed cases of OSCC. Healthy subjects without any tobacco consumption habits formed the control group. The cytosmears from both groups were stained with rapid Papanicolaou stain. MN were identified according to the criteria given by Countryman and Heddle with some modifications. Results : The frequency of MN was three to four times higher in patients with OSCC as compared to patients in the control group and the difference was found to be highly significant. In 75% cases, the cytological grade as determined by the frequency of micronuclei correlated with the histopathological grade and this observation was statistically significant. Conclusions : MN can be a candidate to serve as a biomarker for prediction of the grade of OSCC. Background : Fine needle aspiration cytology (FNAC) has a high rating in the assessment of breast lesions. 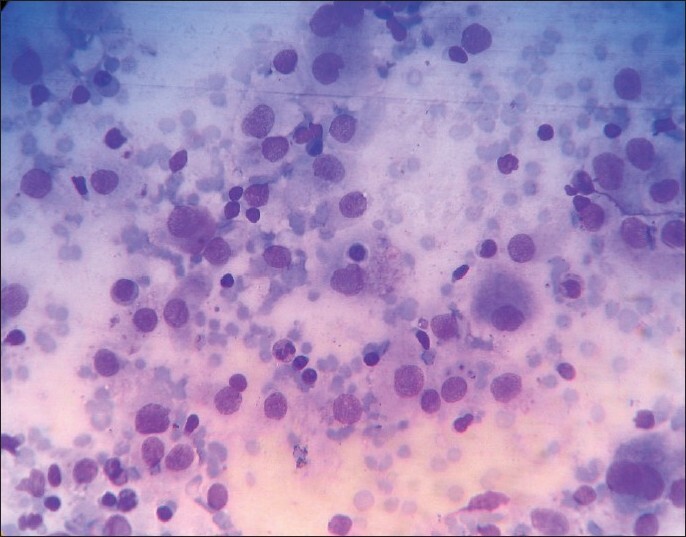 Various methods have been used to diagnose cytology of breast lesions. Aims : Present study was undertaken to evaluate the feasibility of application of systematic pattern analysis based on morphology in diagnosing breast aspirates. Materials and Methods : This is a retrospective study of FNAC of the breast done over a period of 4 years in a tertiary care centre. A total of 225 cases of breast lesions for which FNAC was done with histological follow-up were included in the study. Breast aspirates were provisionally diagnosed based on systematic pattern analysis. 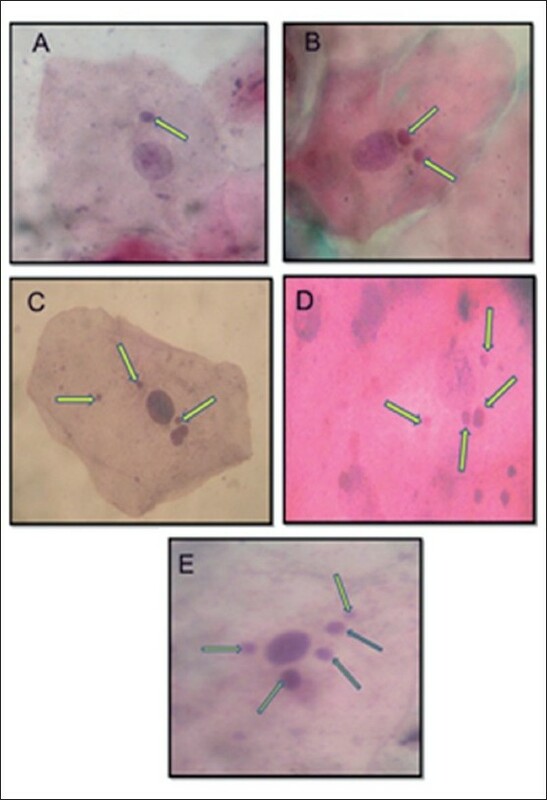 Aspirates were grouped into six categories based on predominant cellular pattern, and correlation between cytological and histological diagnosis was assessed. Results : Application of pattern analysis on FNAC of breast lesions in our study had a sensitivity of 94.5%, specificity of 98%, diagnostic accuracy of 97%, positive predictive value of 95.8%, and negative predictive value of 97.4%. Conclusions : Systematic pattern analysis based on morphology of FNAC smears was found to be highly reliable and could be easily reproducible in the assessment of breast masses. Background : Early pathological classification of retroperitoneal masses is important for pin-point diagnosis and timely management. Aims : This study was done to evaluate the usefulness and drawbacks of guided fine needle aspiration cytology (FNAC) of retroperitoneal masses covering a period of two years with an intention to distinguish between neoplastic and non-neoplastic lesions and to correlate with histologic findings. Materials and Methods : FNAC was done under radiological guidance in all cases using long needle fitted with disposable syringe. Appropriate staining was done and cytology was correlated with histology which was taken as the gold standard for comparison. Results : Fifty-one patients who presented with retroperitoneal masses were studied. 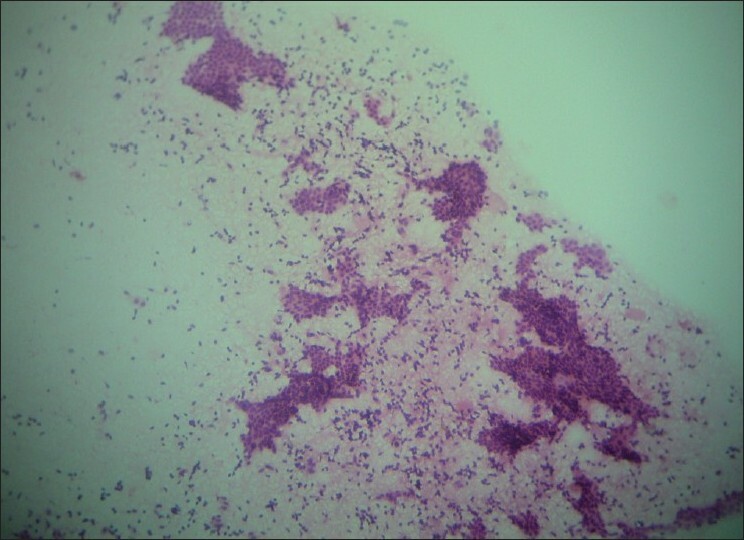 Forty-four lesions were malignant cytologically and 7 were inflammatory (tuberculous). According to radiological and cytologic findings, we classified our cases into four groups: renal tumors, retroperitoneal lymphadenopathy, germ cell tumors, soft tissue tumors. Except for cases of non-Hodgkin lymphoma (NHL) and metastatic lesions, we had sensitivity and specificity of 100%. In NHL the sensitivity and specificity were both 50%. In cases of metastatic adenocarcinoma, the sensitivity and specificity were 84.6% and 81.8%, respectively. Conclusions : Ignoring the pitfalls, guided FNAC is still an inexpensive and reliable method of early diagnosis of retroperitoneal lesions. Multiple infections are a common feature of acquired immunodeficiency syndrome (AIDS), but coexistent infections at the same site are rare. In this report, we describe a 35-year-old human immunodeficiency virus infected male with coexistent cryptococcal and mycobacterial lymphadenitis. He presented with generalised lymphadenopathy. 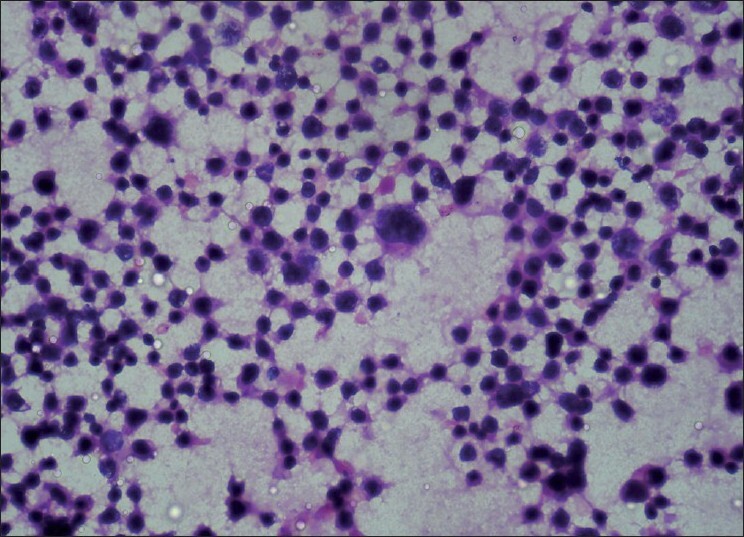 Fine needle aspiration cytology of enlarged cervical lymph node, aided by special stains, revealed coexistent cryptococcal and mycobacterial infection. Coexistent infections pose diagnostic problems in AIDS patients and are likely to be missed. Special stains are valuable for accurate diagnosis of coexistent infections. 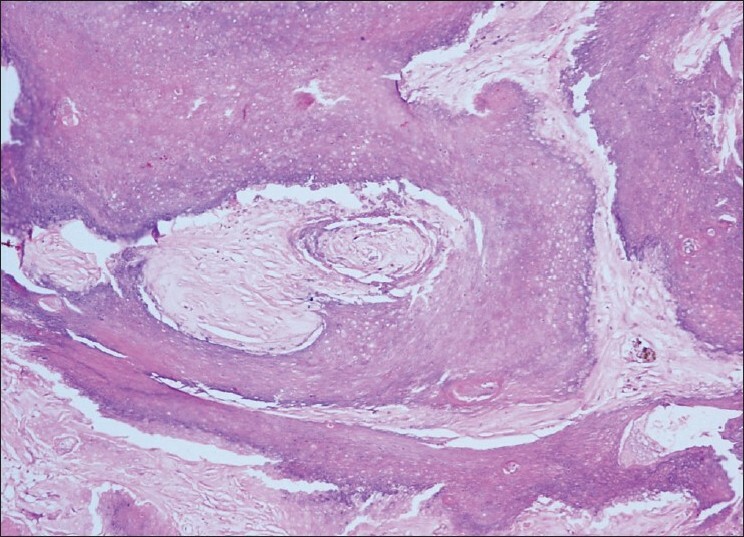 A clinicohistopathological study of a rare case of adamantinoma of long bone in a 78-year-old patient is presented. The cytological features when evaluated in conjunction with clinical and radiologic features are sufficiently diagnostic. 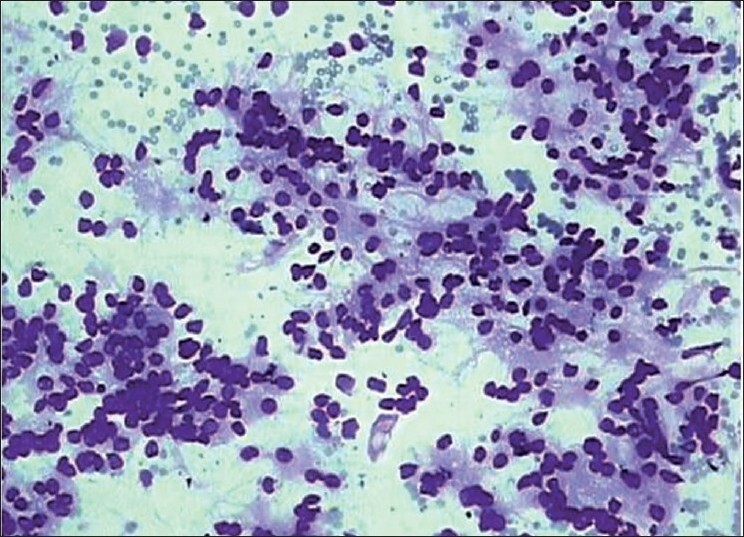 The primary knowledge of its existence and knowledge of its cytological features are important for a correct preoperative cytological diagnosis. Cytodiagnosis of cutaneous metastasis of renal cell carcinoma (RCC) in the absence of history of primary tumor is difficult as it can be confused with other clear cell tumors. We report here a case of cytodiagnosis of cutaneous metastasis of RCC in a patient who had nephrectomy done 9 years back at some other centre, but did not have any records with him. Clinicians should be aware of the possibility of primary internal organ malignancy in patients presenting with cutaneous lesions and therefore conduct a careful examination and get necessary investigations. Prompt diagnosis and treatment will have its bearing on the eventual outcome. 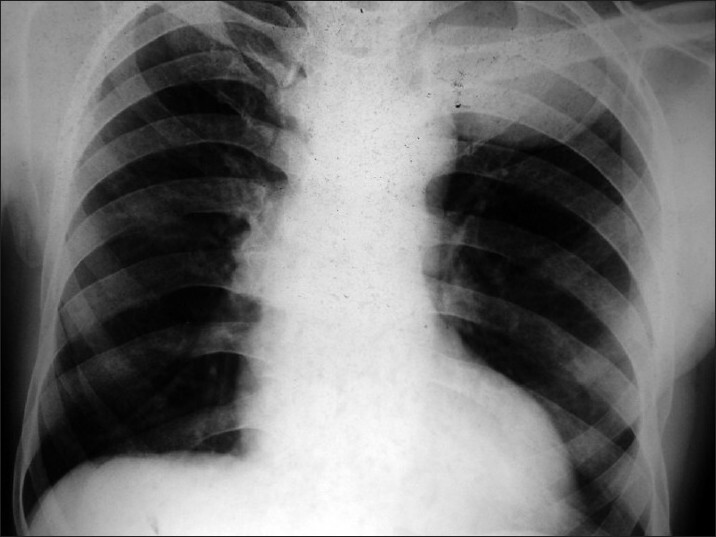 Myxoid liposarcomas metastatic to lungs and mediastinum are infrequent lung neoplasms. The tumor has an aggressive course and needs to be recognized cytologically. A 60-year-old male smoker presented with gradually progressive left-sided chest pain, cough, and expectoration for the past one month. Chest radiograph and computed tomography of thorax revealed a lung mass in left apical region extending into the posterior mediastinum, which was subjected to ultrasound-guided fine needle aspiration (FNA). Smears showed a cellular tumor with ovoid to spindle shaped tumor cells in a myxoid background having a rich vascular network. The possibility of a myxoid liposarcoma metastatic to lung and mediastinum was suggested and confirmed by histopathology. A previous history of excision of a tumor in the thigh one and half years ago was present. The importance of recognizing the cytological picture by FNA is discussed. Virus associated hemophagocytic syndrome is a non-neoplastic, generalized histiocytic proliferation with prominent hemophagocytosis associated with a systemic viral infection. We report a case of cytomegalovirus (CMV) associated hemophagocytic syndrome in a 2 month old male child presenting with rashes, fever, hepatosplenomegaly, cervical lymphadenopathy and pancytopenia. 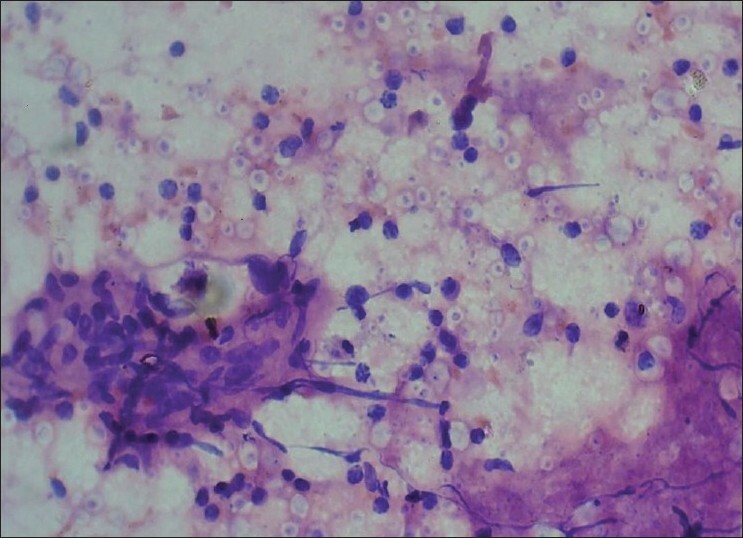 Fine needle aspiration cytology and biopsy from cervical lymph nodes revealed prominent hemophagocytosis. Serology for CMV IgM was positive in both the mother and the child, suggesting recent infection. Possibly there was intrauterine transmission of the infection. Testicular neoplasms which show a wide variety of morphologic types, comprise a small proportion of malignancies. Early identification and treatment is essential for achieving long term survival. 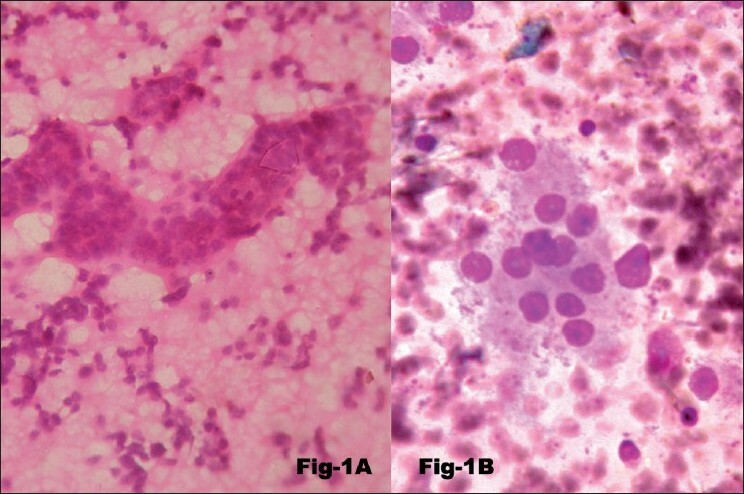 The cytologic findings in fine needle aspiration smears from left testicular swelling of a 49 year old male suggestive of a germ cell tumor was complimented by cell block preparation as seminoma. This was confirmed by histopathologic studies. We are presenting this case to emphasize that cell block can be used for diagnosis of testicular tumors. Mucinous carcinoma of the breast is a relatively rare, pure form accounting for 2% of all breast cancers. Pure mucinous carcinoma of the breast has a favorable prognosis. The common age is postmenopausal group. 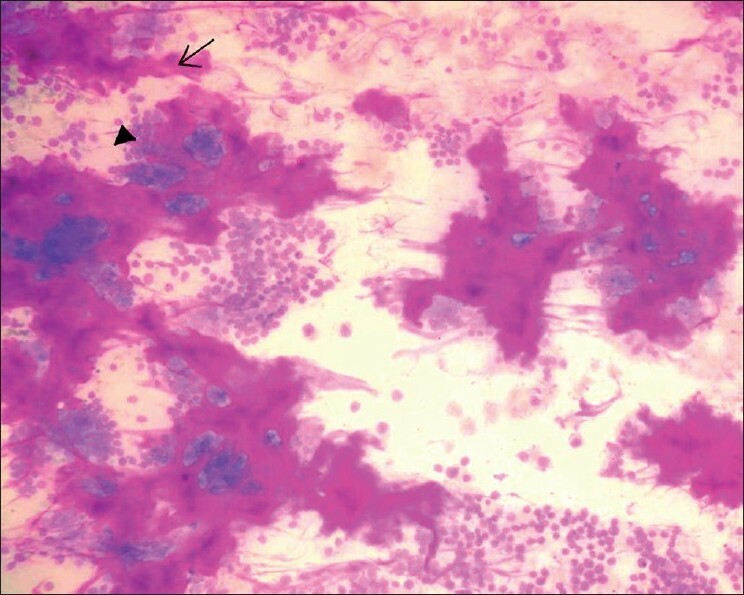 Here, we report a 30-year-old female patient diagnosed on cytology as mucinous carcinoma of the breast with lymph node metastasis and subsequently confirmed by histopathology. In 1 year follow-up, the patient did not show pulmonary or distant metastasis and received adjuvant chemotherapy at every 3 weeks interval.